We serve people residing throughout the South Island, including Canterbury, Otago, Nelson, Marlborough, West Coast, Central and Southland. We are constantly developing our mobile bone density screening service to include a large variety of outlets we run clinics from. These include pharmacies, health shops, naturopathic centres, fitness centres, osteopathic centres, medical centres, hospitals and work-places. The Bone Density Test is conducted by Quantitative Ultrasound. It is a reliable technique to assess bone density, which is the measurable risk of fracture due to Osteoporosis. The test measures the bone density of the trabecular bone at the heel, which is the inner honeycomb like part of the bone. Trabecular bone is found in largely in the hip, spine, heel and wrist. The heel is used because it is an accessible site to measure, it is weight bearing and indicitive of hip and spine. 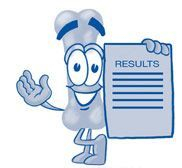 Tests are conducted by OsteoHealth NZ's trained operators. 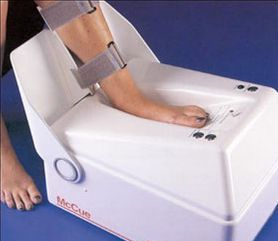 The heel of one foot is placed in the ultrasound machine (as shown in the photo) and all that is required is the removal of one shoe and sock. Consultations take 15 minutes, results are immediately available and explained, and information regarding prevention of osteoporosis and maintenance of healthy bones is also provided. Your company may invite us to your premises for scanning your staff. Not only is it beneficial for general health, it may also save you time and money in reduced accidents and sick leave. We can accommodate between 20 - 25 clients per day. Contact us for more information. If you think your clients, customers or patients would benefit from a clinic at your premises please email us or call us and we would be happy to discuss your requirements. We have gift vouchers that you are welcome to purchase for someone you love. It could literally be the 'gift of a lifetime'. Using clinics at a variety of outlets makes us available for those people who are not able to travel for a scan, and for those who find they cannot afford the higher prices of the DEXA scans. OsteoHealth scans are available at less than half the price for a DEXA scan. We are motivated by the fact that we can make a difference to the very high occurrence rate of Osteoporosis in New Zealand. Osteoporosis is largely preventable and people need clear-cut answers and advice as to what is happening to them and how to resolve any problem. There are many life-style factors involved in the development of osteoporosis which, when corrected, can prevent the onset of the disease, and even reverse the progression of the disease.